According to Disney, Chip is the logical schemer, and Dale is the misfit. An easy way to visually tell them apart is that Chip has a small black nose (it looks a bit like a chocolate "Chip" as a way to help people remember who is who) and two centered protruding teeth, whereas Dale has a big red nose and his two prominent buck teeth exposed. Chip is also depicted as having smooth, short fur atop his head while Dale's tends to be ruffled. In the '50s, they were given their own series, but only three cartoons were made; Chicken In The Rough (1951), Two Chips And A Miss (1952) and The Lone Chipmunks (1954). Remember every time you purchase Chip n Dale artwork over $995, shipping is FREE in the continental U.S. and there is NO SALES TAX when you purchase outside of Colorado. 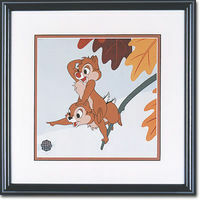 We SHIP WORLDWIDE and offer Layaway for Chip n Dale art.